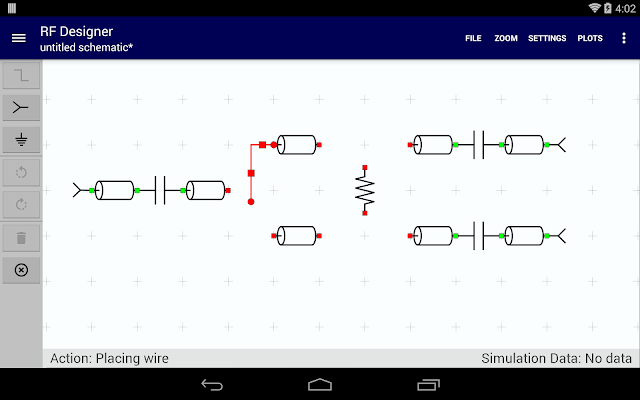 2) Tap the screen where you would like the first node of the wire to start. This can be on a component node, another wire segment, or anywhere on the screen you wish the wire to start. 3) Once tapped, a red circle will appear showing the location of the start point of the wire. If this node is not where you want it, simply touch and drag the node to the correct location. 4) To create a new line segment, touch the screen where the second endpoint should appear. The line segments will only run in horizontal or vertical directions. When placing the next endpoint, the program will determine which length in the x or y direction is greater from the previous point and run the wire in that direction. 5) Once the second endpoint has been established, the line segment will appear as red. A red wire means this wire is being placed. 6) Continue placing endpoints until the desired wire is complete. 7) Wires will automatically finish if they are connected to a part node or another wire segment. A wire may also be finished by double tapping anywhere on the screen or by pressing the green button found in the tools bar. The wire will turn blue indicating it is now a part of the schematic and is selected for editing. 8) To deselect the wire, tap once again anywhere on the screen. The wire will turn black at this point. 9) At any point during the wire placing operation, the user may cancel the operation by pressing the Cancel button in the tool tray. All segments and endpoints of the wire will be removed. 1) To select a wire, simply tap on it. It will turn blue to indicate it has been selected. 3) Endpoints (ahown as circles on the ends of the wire) may be dragged in the direction that their line segment runs. It is possible to drop an endpoint on the opposite end of the line segment to remove that line segment. 4) Line segments may be moved by touching and dragging the "wire grip" (shown as a square in the middle of the segment) and dragging it. A vertical wire segment can be moved horizontally and a horizontal line segment may be moved vertically. Last bumped by rftools on Sat Jan 03, 2015 11:47 pm.